From Roses to Rainbows: Modern Obsession? I don't think selfies are bad either, it's just the overuse of them that worries me. Ha ha! I love that quote! I find that if I think I am having a good hair day or something and want to send a pic to a friend, I delete what I take immediately. The camera does NOT like me! Even when I try to take one with the cat, I just end up deleting it. Ugh! I love your seflie quote so true. Yes, it is. Problem solved. You had your hands full indeed! What is that, a lizard? That was a baby alligator. We had just taken an air boat ride in Florida. 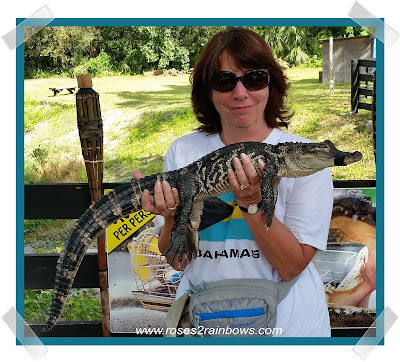 You are brave to hold a baby alligator. I am assuming it still could bite. I also don't like photos of myself at all so selfies won't ever happen for me but if others get their kicks I don't have a problem. BUT as with anything it can be overdone. Yes, he could bite, but he was muzzled with some tape. That was an awesome experience! I'm with you on the selfies!